Before the Oilholic called time on CERAWeek 2019, this blogger had the absolute pleasure of meeting and greeting David Farr, the inimitable Chief Executive and Chairman of energy industry vendor Emerson Electric (NYSE:EMR) on the sidelines of the event on March 13. Farr, who has been Emerson's boss since 2000, has overseen the company's market valuation double under his stewardship. In a wide-ranging discussion, the industry captain touched on Emerson's performance, the Industry 4.0 challenge, change management, and more. No conversation would have been complete without touching on the portfolio shake-up that Farr has brought about at Emerson, and the unsuccessful bid for Rockwell Automation that did not turn out to be so bad in the end! Ultimately, it all bottles down to corporate agility, and Farr said Emerson's two broad business streams - Automation and Commercial and Residential solutions - encompassing a diverse range of brands and businesses is working out pretty well. Interested in more? Read the Oilholic's full interview with Farr for Forbes here. That's all for the moment folks! Keep reading, keep it crude! © Gaurav Sharma 2019. 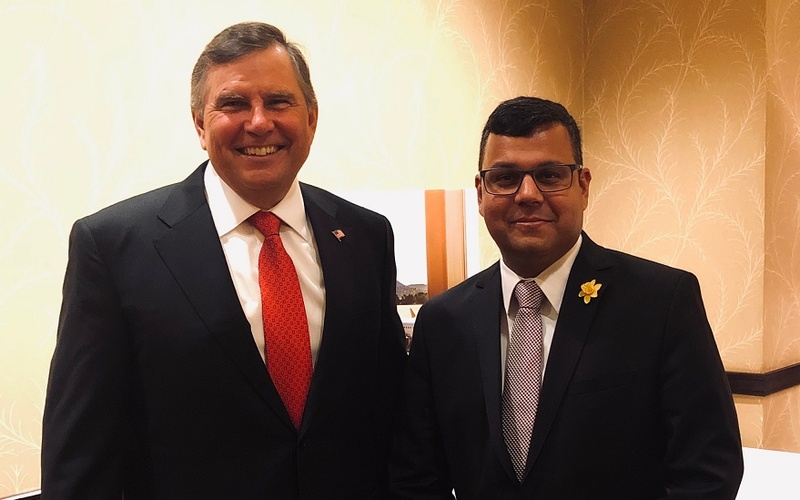 Photo: David Farr (left) with Gaurav Sharma on March 13, 2019 at CERAWeek in Houston, Texas, USA. 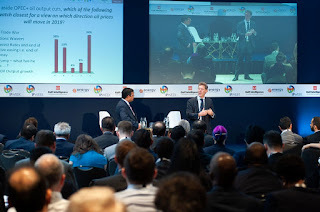 Days IV and V of CERAWeek 2019 have zipped by with an emphasis on power markets and technology. Since it was all about electricity and technology; here's a photo of ABB's Formula E car on display here in Houston, and yes the Swiss automation and robotics giant's YuMi robot was here too. And here is the Oilholic's full report for Forbes on how technology is making rigs 'smarter'. Its not just the greenfield sites we see this at play in, as a number of brownfield sites are being retrofitted as well to optimise performance and efficiencies. Finally, as is customary at CERAWeek, the Mayor of Houston Sylvester Turner turned up, and this year he reminded delegates that H-Town has sufficiently diversified to have the spheres of education, medicine and information technology sit happily alongside the City's energy sector. In fact, the IT industry here is growing at such a rapid place that you can call it 'Silicon Bayou' and promote #SiliconBayou, he added. The Oilholic promptly did so. And that's all from CERAWeek 2019 and Houston. Keep reading, keep it crude! Day II or Tuesday (March 12) of CERAWeek zipped by, Wednesday is about to come to a close here in Houston and there have been several discussion points. 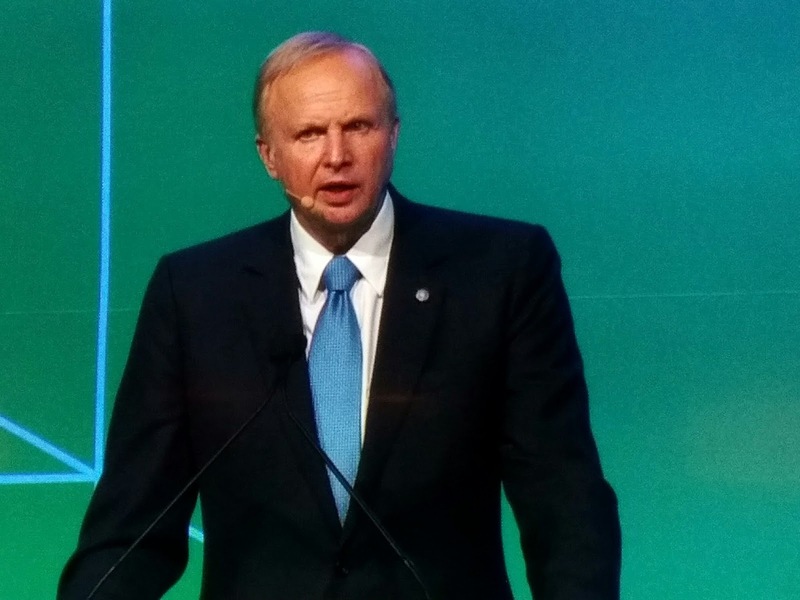 Where to start when penning thoughts on the last 48 hours - a lot of plaudits were won by BP boss Bob Dudley's dinner speech overnight on the evolving oil landscape. "Oil and gas majors need to recognise the world's low carbon future. They need to be progressive for society and pragmatic for investors," he noted to considerable applause. Earlier on Tuesday, OPEC Secretary General Mohammed Barkindo took to briefing journalists and analysts. Key points made included being 'apolitical' on the Venezuelan situation and launching a polite but firm attack on efforts by US lawmakers to hit OPEC with antitrust action - dubbed the No Oil Producing and Exporting Cartels (NOPEC) Act. Here's yours truly's full report for Forbes. The UAE government envoys were also in town promoting their catchy 'Oil and Gas 4.0' drive ranging from investing in digital assets to upskilling and hiring, from AI to robotics. William Clay Ford Jr was around too telling CERAWeek when Ford's F-150 truck's electric version is available it'll be a "completely different animal" and also admitted he had a soft sport for the Mustang. On Wednesday (March 13), Centrica Group CEO Iain Conn said societal pressures, e.g. UK government's energy price cap, are eating into utilities sector's operating margins, and that (yes) natural gas will serve as a bridging fuel for decades. Away from Brexit chaos back home, he also noted: "While the energy market will not be materially disrupted by Brexit; UK energy consumers would be left worse off if a declining GBP contributes to higher domestic energy bills linked to global markets." US Energy Secretary Rick Perry also turned up for his second successive CERAWeek making a wide range of points from sanctions on Venezuela to President Donald Trump's opposition to NordStream 2. Finally, here is the Oilholic's take on what ExxonMobil's Marine Fuels business makes of the approaching IMO 2020 rule. Well that's all for the moment, more from Houston soon. Keep reading, keep it 'crude'! © Gaurav Sharma 2019. Photo: BP CEO Bob Dudley addresses CERAWeek 2019 © Gaurav Sharma 2019. The Oilholic is back in Houston Town for CERAWeek 2019 with talk of Saudi Arabia extending its oil export cuts to April, an OPEC summit due on April 17, and of course oil benchmarks still remaining largely range-bound. The tone of the first day for IHS Markit's industry jamboree was set by the International Energy Agency's annual five-year market assessment. The agency's Executive Director Dr Fatih Birol, said here in Houston that there should be no doubt that a second wave of the US shale revolution was coming, with American production tipped to cap that of the Russians and the Saudis by 2024. Later, speaking to the Oilholic, Birol said the agency's take does factor in rates of decline. Here's a full report for Forbes. There were loads of other catchy soundbites yours truly tweeted regularly from Day I of CERAWeek (welcome to follow here), but really Birol's words set the tone. As for oil benchmarks; both Brent and WTI were down last week, and are up this week but haven't spiked in the strictest sense. For the Oilholic, Brent futures sentiment still isn't decisively bullish. More from Houston soon! Keep reading, keep it crude! © Gaurav Sharma 2019. 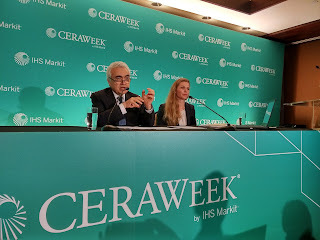 Photo: Dr Fatih Birol, Executive Director of International Energy Agency speaks at IHS Markit's CERAWeek 2019 conference.© Gaurav Sharma 2019. 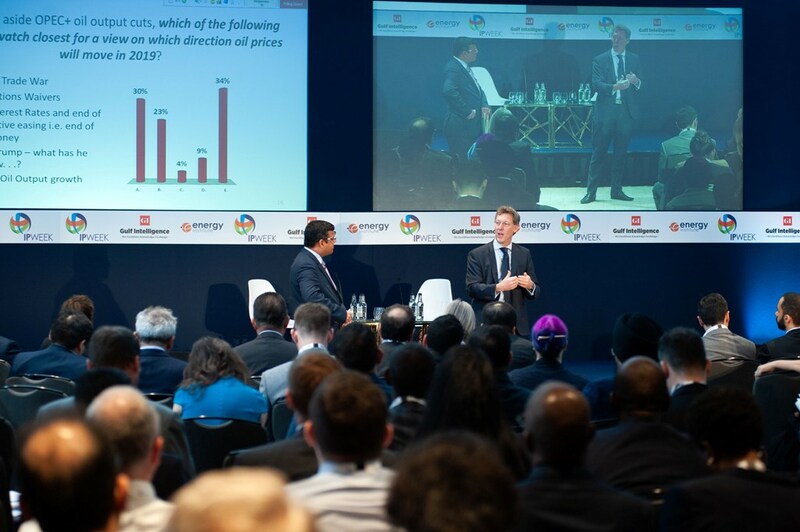 A fascinating few days of debates and deliberations at the Energy Institute's International Petroleum Week 2019 came to a close in London earlier today. For yet another year, the Oilholic was delighted to have spoken and moderated at the event as part of the Gulf Intelligence Middle East Energy Summit. Industry 4.0, investment climate, US shale and OPEC were all under the radar. Delegates were fairly evenly split on the direction of the oil price; but yours truly maintains that the phase of range-bound crude prices is here to stay. From where this blogger sits, it is appearing hard for Brent to escape the $65-75 per barrel range, and for the WTI to escape the $55-65 range this year. There were interesting soundbites aplenty, but BP Boss Bob Dudley's quip that US shale is a price responsive "brainless" market stood out among them all. Here's the Oilholic's full report and analysis on it for Forbes. That's all for the moment folks! Next stop - Houston, Texas for IHS CERAWeek 2019. Keep reading, keep it crude! © Gaurav Sharma 2019. 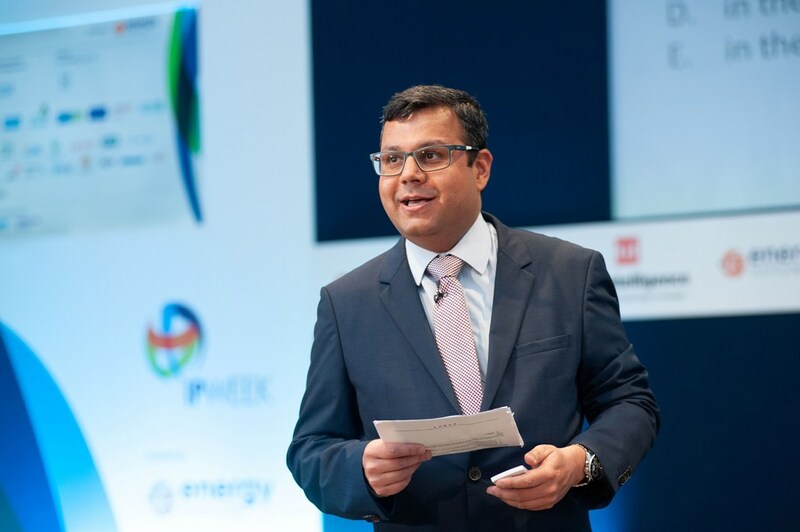 Photo: Gaurav Sharma at IPWeek 2019; with Chris Midgley, Global Director of Analytics for S&P Global Platts © Gulf Intelligence.